I spent this past weekend in the Poconos enjoying a bit of a snowcation at the Pocono Manor. Read about my first night here. 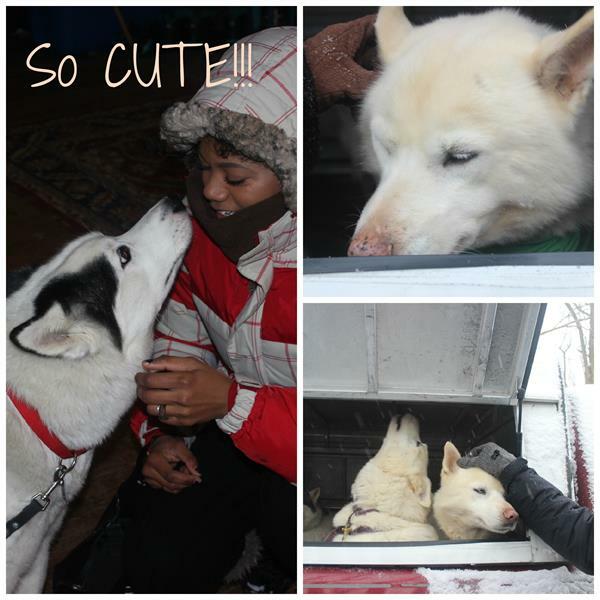 On Day 2, we decided to go dog sledding with Arctic Paws Dog Sled Tours. I have to admit I was a bit nervous for a variety of reasons. Firstly, dogs aren’t known for the length of their attention span. I was sure one would get distracted midway and zoom off the trail. Secondly, and I know this isn’t everyone, but I was worried about the dogs’ lives when they weren’t working. Are they being well fed? Do they get to play? Are they treated well? Thirdly, I wasn’t sure this was an activity for kids because it seemed a bit rough. Well, after spending the morning dog sledding, I found answers to all my questions and shocked myself by actually doing it. 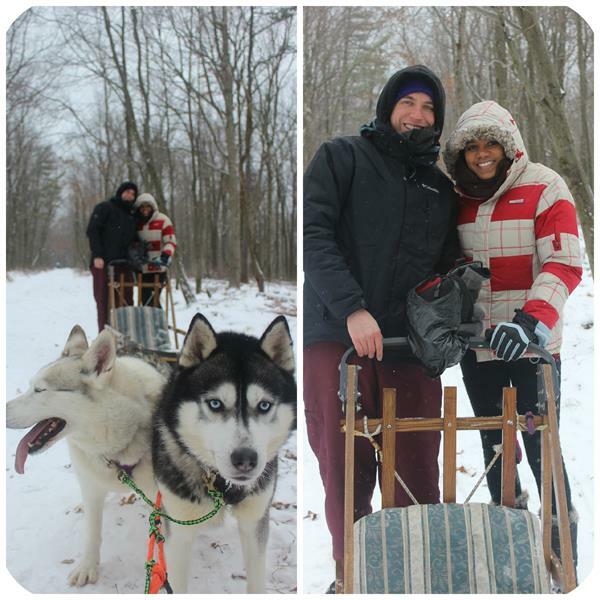 Here are 3 things you need to know before going dog sledding in the Poconos with kids. 1) The dogs are safe to be around. Safety is always numero uno for me. If you’re with kids, this is even more important. When we arrived at the trail, the dogs were kept in the back of a trailer. They were so so friendly. They were climbing over themselves to be petted and to interact with guests. They were so adorable and beautiful. I wanted to take one home with me. It turns out that not only are they trained, they also assume positions on their own. There are lead dogs that run in the front of the other dogs. These assume position and the others run around trying to find their right position behind these dogs. This happens when they are left in a pack on their own. They’re huskies and are natural workers. They’ve also all been doing this for many years so they know the path and the drill well. During my ride, one of the lead dogs actually paused to roll in the snow momentarily and the others stopped and waited for him to lead them again. Also, when standing, the sled is really easy to stop with a handy break pedal. So if the dogs do flip out (IF…) you can always just push the pedal and they all feel the tugging on the rope it’s attached to and they stop. I tried this several times when they were going too fast for my comfort level and they slowed every time. If you’re worried about the safety of your kids around the dogs, they were absolute dolls around the kid on my run. They cuddled with him and nuzzled his hat, asking to be pet. It was so cute. 2) They live really good lives. I have pets and I wanted to know that these guys were having fun while working and being treated well. Apparently, they all live on a farm with the people who own the company. They have space to run around and play. They love being outside and doing their runs. I was worried about the cold but we saw that they actually have 2 layers of fur. They shed one during the summer and both grow for winter. Even their paws are covered with fur. The only places not covered with fur are their eyes and nose. When their noses gets cold, they cover it with their bushy tails. They also seemed happy. It’s easy to see if a dog isn’t being fed well because he would be too skinny. These were pretty healthy looking and so happy to be around humans. 3) The actual sledding is super easy to do and any child is likely to have fun. You can choose to either stand behind the sled and control the brake or you can sit in the sled and be pulled around. For kids, I would suggest sitting while a parents stands or sitting on the lap of a parent. There are no seat belts because it seems there is no real need for one. The seat is cushioned and pretty snug. The ride is also not as bumpy as I thought it would be. It was pretty smooth riding. I didn’t at any moment feel afraid of falling out. Also, remember what I said about the brake? If you’re standing and your kid is sitting and they start freaking out a bit, you can easily stop the ride with your brake and climb in there to be with them while someone else stands. So in summary, it’s safe for the dogs and it’s safe for you and your kids. Lastly, it’s a super fun way to embrace the snow. You can arrange it with the front desk at the Pocono Manor. NOTE: It’s super important to dress warm as this is an outdoor activity. Think hats, ear muffs, gloves and many layers of clothing. The jacket that saved me is from Planet Earth. Parts of this trip were compensated. who knew? looks like you both had a great time and the dogs are so beautiful!! wow, I have lived in the Poconos for about 12 years and never knew about this. Sounds like a fun day.